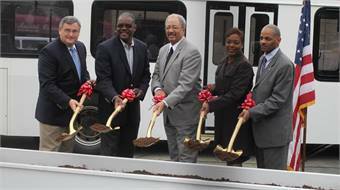 SEPTA GM Joseph M. Casey and local officials break ground on the reconstruction of the 23rd and Venango Bus Loop. Photo courtesy SEPTA. Southeastern Pennsylvania Transportation Authority (SEPTA) broke ground on the reconstruction of the 23rd and Venango Bus Loop in the Allegheny West section of North Philadelphia on Wednesday. 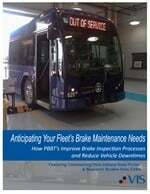 The project will result in the full renovation of a key, but aging, facility for city bus operations. "In addition to modern amenities for customers, the completed loop will serve as a grand gateway to the revitalization efforts now underway in this section of North Philadelphia" said SEPTA GM Joseph M. Casey. "SEPTA looks forward to providing the community with a first-class facility." The $1.4 million to be used for the project will come from savings from funds secured with the assistance of U.S. Representative Chaka Fattah for a separate bus loop project that came in well under budget, according to SEPTA. SEPTA serves more than 5,000 riders daily from the loop. In addition to neighborhood residents and nearby businesses, it also provides service to the Salvation Army's Kroc Center and the Baker's Center Shopping Complex. New bus boarding islands, passenger shelters, enhanced lighting, trash cans and recycling bins, and signage. Bike racks will also be installed. Safety enhancements for customers, pedestrians, and motorists using surrounding roads with bus lane and crosswalk striping, new bus driveways, and repaved pedestrian sidewalks. Full accessibility under the Americans for Disabilities Act (ADA). ADA-related improvements include raised boarding platforms and new curb cuts. New landscaping on the site and its perimeter will improve atmosphere for riders and residents.